This episode has no specific astronomical topic but draws attention to a very special astronomy meeting later this month. The Royal Astronomical Society’s annual National Astronomy Meeting last year was held in Wales, next year it will be in Scotland but this year it is in Manchester. 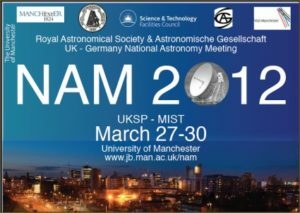 National Astronomy Meeting 2012 or NAM2012 will be hosted by the University of Manchester in partnership with Germany’s equivalent to the RAS, the Astronomische Gesellschaft in the last week of March 2012. Despite the title it is very much international in nature with professional astronomers attending from USA, Australia and Europe. I hope be blogging from the meeting, if you are around do stop by and say hello. I plan to record interviews with some of the speakers for future astrotalkuk episodes. Two plenary session talks during each day of the week between 09:00-10:00 and again between 17:00-18:00 (except Fri 15:45 -16:45). Contact Anna.Mayall@manchester.ac.uk Group booking by astronomical societies are welcomed but should done quickly – its first come first served. A program of talks specifically for A level students. They are day-long event not free but refreshments are included. A unique social event on the evening of Tuesday 27th in a city centre pub, an unusual blend of standup comedy and science £3.00 at the door. In the following recording by telephone Dr Tim O’Brien from Jodrell Bank, explains the background to NAM2012 in Manchester. Incidentally, like me, you may enjoy a picture on Tim’s website. No doubt taken during the emmensly successful Stargazing live event earlier this year. It show’s Tim falling asleep in his chair with Dara Obriain looking on with Prof Brian Cox in the background. All the links online in episode 49. Here’s Tim.